Nobody enjoys having a dry mouth, but you can usually solve the problem by simply drinking some water. However, some suffer from constant dry mouth, which is a condition known as xerostomia. While some of the causes of xerostomia are relatively benign, it can also be a cause for concern in certain situations. If you have been suffering from chronic dry mouth, there are several reasons why it may be happening. Dehydration is the most common cause of dry mouth, and fortunately, the most easily fixed. When your body is not properly hydrated, your mouth becomes dry, signaling that it’s time to drink some water. Whether you’ve been sweating from working out or you’ve simply failed to drink enough water, all you have to do is fill a glass with water and drink up! Another extremely common cause of consistent dry mouth is the use of certain medications. Medications can have certain pharmacologic effects that reduce your ability to produce saliva or cause overall dehydration. The medications that are most likely to cause dry mouth are generally those that are used to treat anxiety, depression, high blood pressure, or allergies. Muscle relaxers and painkillers are also known to have dry mouth as a common side effect. Many people suffer from dry mouth more and more as they get older. This increase can be simply because of the body changing, or it could have to do with long term use of medication or other more serious health problems. It can also stem from a lack of proper nutrition. Alcohol is a diuretic that can lead to dehydration very quickly. Dehydration will cause your mouth to become dry during and after the consumption of alcohol. When combined with tobacco use, it can become even more severe. This is because the nicotine in tobacco reduces your saliva flow, which can lead to a dry mouth, as well. The best way to combat this is to quit smoking entirely. If you must drink alcohol, try to alternate every drink for a bottle or glass of water over the course of the night. Injuries that cause nerve damage in your head or neck can also lead to dry mouth symptoms. Certain nerves in these areas can control the production of saliva, and if they are not functioning properly, they can lead to reduced saliva and a dry mouth. 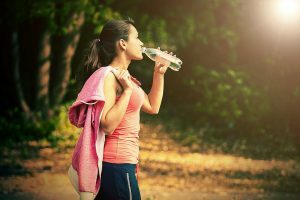 A dry mouth may seem like a minor inconvenience, but there are several bigger problems that it can lead to. Having proper saliva production protects the enamel on your teeth, and dry mouth can lead to dental problems such as gingivitis, tooth decay, and mouth infections like thrush. In addition to drinking water, there are a few more ways that you promote proper saliva production. These include chewing sugar free gum, brushing with fluoride toothpaste, and using a humidifier in your room. You should always see your dentist if you feel that your dry mouth is becoming a problem. To determine causes and solutions for your constant dry mouth, schedule an appointment at Dr. Keith Schwartz to discuss any dental issues that you may be having!